What do you use to screen films? Do you screen from DVD? How are you different from commercial cinemas? I’ve heard you’re getting a new theatre? Do I need to be a student or staff member at the ANU? Can I buy a ticket to just one screening? Can I just come along for the second film of a double feature? What happens if there are no seats left? How do I find out about unexpected screening changes? What do I do if I’ve left something behind at a screening? What is a ‘No Guests’ screening? Can I bring guests along to screenings? Can I bring children along to screenings? What do I do if I’ve forgotten or lost my membership card? Can other people use my membership card? Is there anywhere to buy snacks and drinks prior to screenings? Can I bring my own food in with me? From February 2019, the ANU Film Group will be located on the ground floor of the Cultural Centre within the new Kambri Precinct of the ANU in Canberra. It can be found as Building 153 on any ANU Campus maps. There is underground parking with 400 car spots below our building. This is a paid facility operated by CarePark, and pricing at time of writing is a $6 flat rate for entry after 5 pm on weekdays and a $5 flat rate for all day parking on weekends. There are also limited street parking spots along Childers Street, University Avenue, Hutton Street and North Road. We use professional digital cinema projectors and a 7.1 digital surround sound system – the same type of equipment used in commercial theatres. We screen all our films in our new 305-seat cinema on a 10-metre wide screen, one of the largest in Canberra. We do not screen from DVDs, as the quality of the picture is not sufficient when shown on our 10-metre wide screen. All films are screened from professional digital cinema equipment, unless specifically noted. As we are not-for-profit, we offer a commercial movie-going experience at an incredibly cheap price: an Annual membership gives you entry into over 200 films for the average price of just six Adult tickets at your local cinema. Plus, many of our members agree that seeing a film in a theatre full of movie lovers who aren’t afraid to laugh, cry or scream only adds to the experience. Simply put, the ANU Film Group is the best way to see movies in Canberra! Yes! We’re very excited to announce that we have been working with the ANU over the past three years on the development of a purpose-built cinema that is intended as a new home for the ANU Film Group from February 2019 onwards. Check out our new theatre FAQ for more information. To become a member of the ANU Film Group, all you have to do is come along to any screening and join up in person. We accept cash, EFTPOS, Visa and Mastercard payment at screenings. There is a 2.3% surcharge for all card payments at screenings. More details, including available membership options, can be found here. Absolutely not! While the ANU Film Group based at the Australian National University in Canberra, membership is open to anyone and everyone. You don't have to have any affiliation with the ANU – all you need is a desire to watch films in a full cinema setup for an excellent price. We aren’t able to sell tickets for individual films, but we do offer Weekly memberships that allow you to see as many films as you like within seven days of the date of purchase. These cost $15 each and are comparable in price to a single ticket at commercial cinemas. Best of all, if you end up liking what you see, you can upgrade your Weekly to a full membership too. All you have to do is bring in your Weekly membership card up to two weeks after expiry and receive $10 off a full Annual or Season membership. All screenings start at 7:30 PM, with the exception of select Saturday sessions, which start at 5:00 PM. We do not screen adverts or trailers, so please ensure you arrive by the advertised start time to avoid missing the beginning of the film. Doors will only open 30 minutes prior to the start of the screening, so there’s no reason to arrive any earlier. If you’re joining up, be sure to come along at least 15 minutes before the start of the film (or earlier if you’re joining up towards the beginning of the season) to ensure sufficient time to fill out your membership form and find a good seat. Yes. All double features include a ten minute intermission, however, so simply check the running time of the first film, and add 10 minutes to figure out the approximate start time for the second film. Seating is not allocated and only available on a first come, first served basis. So if you’re picky about where you sit, be sure to come along early to save your seat. Our theatre seats 305 people but occasionally popular films can result in all of these seats being filled. If this is the case, we will double-check all of the seats to ensure they are taken before calling a full house. Seating can only be guaranteed if you arrive no later than the advertised start time for the film. If a screening is full and a reasonable number of people are turned away before the scheduled start time, however, then a re-screening will be attempted for a later date and time to be advised. For safety reasons, we are unable to allow people to sit in walkways or bring in additional seating. While we make every effort to stick to our scheduled programme, we will sometimes have to unexpectedly reschedule screenings due to circumstances beyond our control. In the event of such changes, we will advise members as soon as possible through our electronic mailing list and via our website. Announcements will also be made at screenings and signs put up at the theatre, but our mailing list is by far the quickest way to receive such information, so be sure to sign up for it on the front page of this website. Committee members usually do a quick check of the theatre after screenings to pick up any lost property. We have a small cupboard for lost property, so send us an email or check with the Duty Manager at your next screening and we’ll let you know if we’ve found it. If the item is something of value (wallets or mobile phone, for example), it will be left with ANU Security's Lost and Found service for safekeeping. 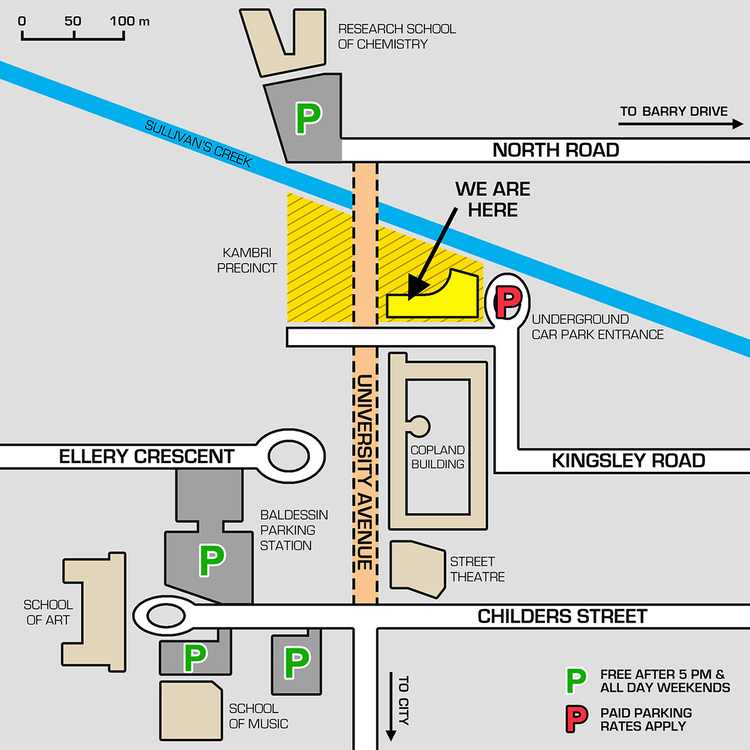 ANU Security is located in the Anthony Low Building (Building 124) near the John Curtin School of Medical Research. Unfortunately, we are unable to store ‘lost’ husbands, wives, partners or children, so please ensure you take those home with you after each screening. Screenings that are marked as ‘No Guests’ screenings means that only members of the Group can attend the screening. This is usually reserved for more popular screenings, to ensure that there remain seats for our members. Memberships will be available for purchase at all screenings, however, so a No Guests screening may be the perfect time to join up if you or your friends aren’t members yet. Members of the Group can bring guests along to screenings provided that the screening is not a ‘No Guests’ screening, and you have sufficient guest passes left. Annual memberships include eight guest passes, while Season memberships include two guest passes. Your guest entitlements are electronically stored and the Duty Manager at each screening can tell you how many passes you have left. Weekly memberships do not include guest passes. Each member of the Group may bring up to two children (under 16 years of age) along for free to screenings that are marked ‘No Guests’. There is no restriction on the number of children admitted to other films, but this is subject to reason and at the discretion of the Duty Manager on the night. All children must remain accompanied by the member during the screening, and entry may be restricted by the film’s censorship rating. If you’ve forgotten your membership card on the night of a screening, we can look you up on your membership system provided you have some photo ID with you. Simply ask the Duty Manager to look up your details. If you’ve lost your card, please let us know ASAP so that we can cancel your card and arrange for a replacement card. This process may take up to two weeks, upon which your new card will be available for collection at any screening. Membership is non-transferable, meaning that only you may use your membership card to attend screenings. We occasionally conduct random ID checks, so if your membership card is found being used by someone else it will be confiscated, and your membership may be suspended with no refund given. Our new home in the Kambri Precinct features an assortment of restaurants, takeaway outlets, cafes, bars, shops and much more. To find out more about what’s on offer, please visit the Kambri website. You certainly can, just so long as you dispose of all rubbish in the bins provided after the screening. Committee members have to stay behind to clean up after each screening and it makes life so much easier if you throw your own rubbish away!